It is with a heavy heart that we pass on the news of Ray Merrin’s passing. A wonderful sound re-recording mixer and supervising sound mixer of many features, including the Oscar winning film The Last Emperor. 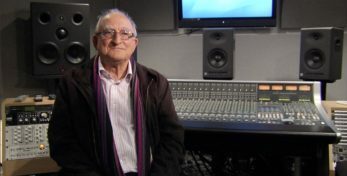 Ray was a sound editor on The Shining, and worked under the brilliant Bill Rowe at Elstree for many years, including being one of the first people to ever work with Dolby sound on the sound mix for A Clockwork Orange. Ray was a very warm, kind and generous man, who took the time on several occasions in his later years to share his memories with our project and with the film undergraduate students at the University of Hertfordshire. Our thanks go to Paul Welsh and Elstree Screen Heritage for facilitating these meetings and for introducing Ray to the project. We last saw Ray when we invited him to a special crew screening of Return to Oz, at Elstree Studios, in celebration of the 30th anniversary of the film. His generosity can be witnessed through the interviews recorded with him, especially the one which went into the oral history documentary of The Shining we later made called Staircases to Nowhere. We send our love and thoughts to his widow Hazel, and his family at this sad time.